I’m reluctant to write about this but I will. Not out of obligation but because I don’t really want to reveal a secret I’d rather keep. Four years ago I went to Croatia for the first time, to Dubrovnik. Lured by anecdotes of stunning coastlines and a frisson of intrigue about its recent chequered history, I spent a week, based in the city, exploring the coastline – that superb coastline where mountains meet the sea – from Marco Polo’s birthplace, Korçula (like a mini Dubrovnik itself), to the extraordinary lakes of Kotor just over the border into Montenegro. I thought then, as I do now, having recently returned there, that this would be a marvellous place to have a second home. So you can imagine my dismay when I learned that according to the World Travel and Tourism Council, it’s to be one of the fastest growing tourism destinations over the next decade. Like any good thing, I suppose. Admittedly, there are several places in the world that can lay claim to being ‘the next big thing’ when it comes to tourist destinations but it seems Croatia certainly features highly. Not just from hearsay – I’ve heard several people say that’s where they’d been holidaying this year – and press coverage but because, behind the scenes, the tourist authorities there have been in overdrive, to promote and encourage tourism, and interest in property there is high, particularly with its entry into the EU ear-marked for 2013. But this surge in interest, contrary to what you might think – and my initial disdain – has been carefully managed. They are quite particular about this influx and not everywhere presents an opportunity to purchase – and to profit from – property. There is to be no land-grab of prime coastline, for the government has legislated significantly to ensure the natural beauty is protected, prohibiting development on virtually all of its coast. Despair not, however, this is good news. Development opportunities may not present themselves but if there’s already property out there…and there is. 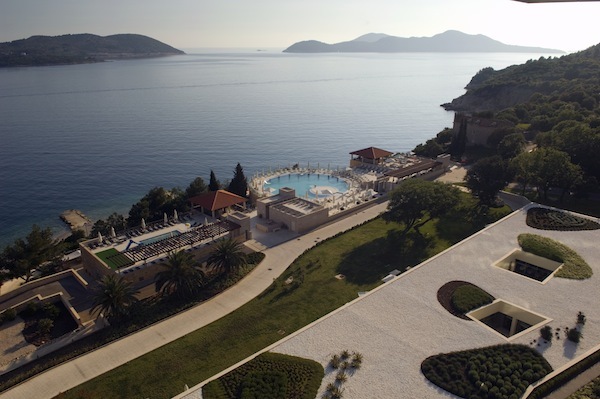 One such opportunity are the residences at Dubrovnik Sun Gardens. 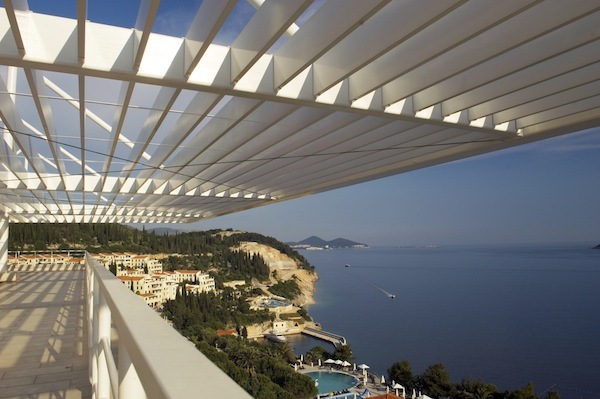 Twenty minutes up the coast from Dubrovnik, the Sun Gardens resort and residences occupy a sizeable chunk of the rugged coastline. As we turn in and dip into the broad circular drive, the first thing that strikes me, bar the imposing monolithic Radisson hotel that we pull up to, is the space; there’s quite a footprint here. Looking up at the hotel and entering the foyer, my first impression is that I’ve stepped into Spain in the 1980s. I wonder if the architects had any say in the matter. Touring the hotel, the aesthetics became far more pleasing and I wasn’t surprised to learn that the designers behind the refit were Hirsch Bedner, famed for hotel couture and counting Four Seasons among their clients. The quality of finish and attention to detail shows and there is, in fairness, one major advantage to the hotel’s design: all suites face the sea with the interiors giving you a view of the Adriatic from all points in the room, including the bathtub. If I thought the hotel structure was somewhat anachronistic, then the sight that met me as we stepped onto the balcony and surveyed the resort from on high almost sent me back in time. 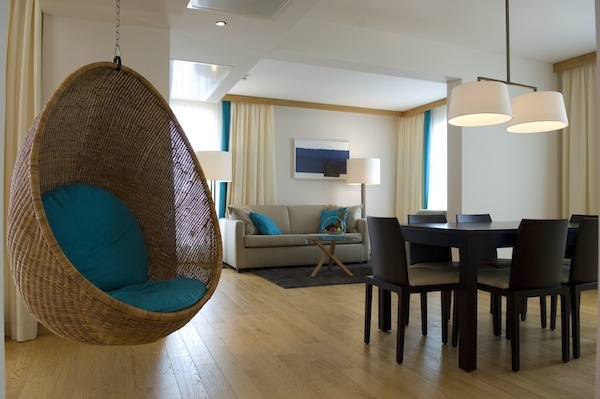 The residences are made up from a remodelled ’80s resort. But not just any ‘80s resort. “Believe it or not but it was built as a desirable Communist holiday retreat,” explains Julian Houchin, Sun Gardens’ Commercial Director, “so if you’d done particularly well in the party, they’d send you here for a vacation, as a perk.” After the fall of Communism, the buildings were then held by the Serbian military as an internment centre for captured Croatian soldiers during the Balkan wars. With such a history, and a chequered one at that, it’s certainly a talking point and, indeed, part of the appeal, but looking out on the regimented architecture here, I wonder if this might not be slightly limiting but it is, I learn, not out of choice. As we walk into the complex itself, to our rooms, I do sense something of the old order of things. 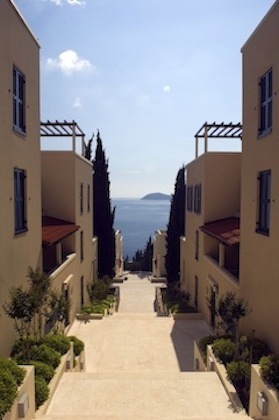 The communal areas in each apartment block do have something of the minimalist, concrete austerity about them but it’s more than made up by the overall aesthetic; window shutters and terracotta rooftops compliment a light sand finish to the buildings, and cypress trees and plenty of shrubbery complete the Croatian picture book. Inside, the suites are, indeed, homely. While the design is not over-stated, even simple, it’s comfortable, cosy and personable. I consider this for a second and then it dawns on me…while I wouldn’t necessarily like to live here – one can’t, by law, as it happens – this is an apartment I would happily holiday in, even wish to let out. That evening, over dinner, in Julian’s hugely enjoyable company, I get more of an insight. He’s a thoroughly effusive and entertaining host and someone who’s taken salesmanship to an art form. “People want hassle-free, maintenance-free living and want to buy in an integrated concept where you buy a property that’s managed and maintained by us when you’re not here.” I have no idea what he’s just said. “We look after your property for you,” he says. You get the feeling that if he’s staked his company on it, you’d want to be in on the action. I’m curious as to how he got involved. “It’s a very interesting story,” he says, “even within the context of European real estate.